I have owned and use a lot of metal detectors in my day since 1960 until now 2018. Approx 50 or so for all kinds of metal detecting. The SST Seems to be very good and easy to use. It has Good sensitivity and ground tracking. Nice TID display and positive iron ID from large to small items. Runs a silent threshold but hits on small targets quite well. The Detector is set up for US coin ID. The SST appears to have near on the same air test all metal capability on gold as does my Gold Bug Pro. Also I feel that the SST ground balance handles high iron mineralisation better than the Gold bug Pro when both detectors have their sensitivity set to max and are fitted with similar size coils. A small irritation is that the machine IDd a 22k 7g ring as a screw cap. Not screw cap or ring, just positive lock on screw cap. Tone was high so you would not leave it un -investigated anyway. Near on all of the gold chain jewellery that I have found displays in the foil and iron range on the SST. Including a 22g 9k albert chain with T bar. Large gold rings display as screw caps foil or pull tab as a combined display. That is why I have become a dig it all detectorist because it is the only way to avoid leaving gold in the ground. 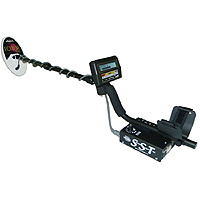 Nice metal detector with good depth capability on coin size targets. Beginners and pro's will get on to good targets with this detector without the learning curve of more complicated machines. It works well from the beaches to the gold fields. The depth test figure I have stated is an Air Test distance on an Aussie 10 cent coin (similar size to a US quarter) with sensitivity set to preferred and with headphones fitted. I bought one a few years back, then I bought another for my friend. Mine had problems, so they sent me a new one! Whites has actually replaced a S.PP. I bought also, after almost 2 years! Whites is probably the best for warranty, and satisfaction concerns! It is very simple to use! Turn on, and go. The settings should never change, just leave it on high mineralization. Also, just a heads up, small gold rings can come back as 6-8, or 12 on the screen. The fattest gold ring we ever found was only like 47. So DIG EVERYTHING that is not obviously trash. Keep in mind, the deeper the target, the less accurate the reading! So if its deep, and you dig it a bit then check again, it will give you a better reading. At first glance the Sierra Super Trac is very easy to operate. It features 3 settings. New comers should be able to pickup the detector and hunt for targets within 30 seconds of turning on the SST. (Other detectors can take as long as 2 minutes to configure prior to starting to detect for targets) The SST has simplicity. The SST also has Discrimination, if new user remember to pay attention to the dark black blocks that appear when going over a target as depending on where they are shown you can determine if the object is of a particular metal just by matching the block to the below Iron/GOLD/Silver chart. If the block is half its size the target is either tiny or deeper (still check small blocks in iron as often they are not iron). If the block shifts around it can mean two targets or its a deep target at depth. If close to target then description of target and metal number is clearly displayed and dark block is steady. Beginners should dig everything to learn the discriminator before choosing to discriminate targets. Gain increase target response making it louder to hear objects in the ground but will increase acceptance to electrical magnetic interference so setting of 5-7 is best. Pin point is a little lacking with the standard 6x10 search coil, it is not very sensitive. It's better to use the tip of coil where the whites logo is positioned to match to the loudest target noise to determine target location than to rely on pin-point. The reason I'm giving this 5 stars is that the SST uses the same PCB as a MXT and therefore someone could add extra features to the SST instead of paying more for the MXT. Whites metal detector. If its not not in the first 4-5" you wont find it with this or any other whites. They probably work OK in dry states but in the east where coins sink fast they just park machines. I've had my SST for a month now. I use it mainly in parks and ghost towns. Love the simplicity compared to my other more advanced detectors. I'm actually finding a lot more nickels and dimes compared to pennies before. It's also very good on jewelry. Love it! I have used the super track extensively. It has long battery life. It tracks honestly and when it hits a target it tells you the possible size and metal content in display. Your experience with detecting helps here as size and mineral content can muddy actual readings. Digging or not digging as in all cases tells you the truth of your display and reading. I have found this to be my favorite machine because of its simplicity and accuracy. It is not a heavy machine and when swinging at moderate speed it can discern multiple hits in a marginal swipe. I have found rings, all types of coins, gold and silver. I give this SST a 5 out of 5 Good job Jimmy and Greg.